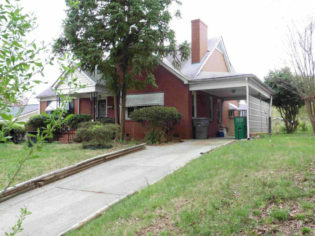 This house first appears in city directories in 2003, the home of Henry D. Harris. The brickwork of the foundation hints that it may be an older dwelling. Built 1959-1960 for G.H. and Carrie Hart. Mrs. Hart taught at the rural Woodland School, a four-teacher school on Moore’s Chapel Road west of the city, which later became Pawtucket Elementary. 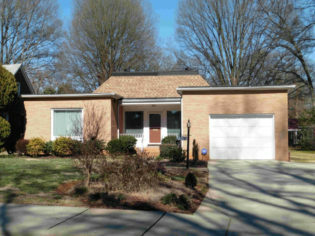 Built 1959-60 for Austin Simons and wife Julia Simons. In a neighborhood where nearly all residents worked in the professions, Mr. and Mrs. Simons were unusual in holding jobs that were much more typical of African Americans in the mid 20th century. Austin Simons was listed in the city directory as a “porter” at Harry & Bryant Funeral Home, one of the city’s long-time white funeral agencies. Julie Simons worked at Harry & Bryant as a maid, perhaps the most prevalent job then among African American women but a rarity in McCrorey Heights. The couple must have been hard workers to build this suburban house. They remained here for over twenty years. Built 1966-67 for Alvin Von Kennedy and Natalie Shirley Williams Kennedy. Mr. Kennedy was a social worker with the Veterans Administration. 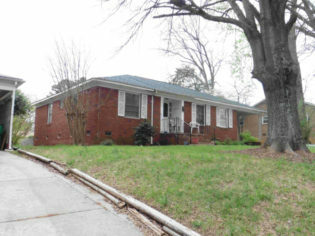 Mrs. Kennedy worked as a teacher, first at Myers Street School when this house was built, and later in the 1970s at Eastover Elementary. The Kennedys’ daughter Natalie Kennedy Beard lives here in the 2010s. She serves as Clerk of Session, the chief lay leader at First United Presbyterian Church in Charlotte’s center city. She is also President of the McCrorey Heights Neighborhood Association. 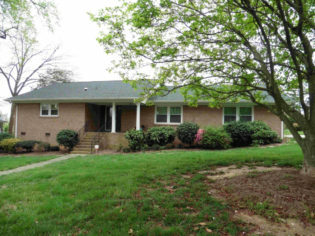 Built about 1974 as a retirement residence for Johnson C. Smith University philosophy professor, tennis coach and administrator Dr. Winson R. Coleman and his wife Theodora, an elementary school teacher. Professor Winston came to JCSU in 1929 to teach Greek and later added philosophy. He earned a PhD at University of Chicago in 1950, one of only four African Americans in the nation to win a doctorate in philosophy during the decade of the 1950s. JCSU named Dr. Coleman as Dean of the University in 1962, supervising curriculum. 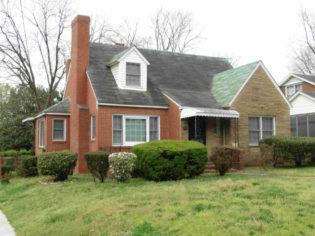 Built about 1960 on Van Buren Avenue in McCrorey Heights, then moved to Washington Avenue in 1969 due to construction of the Northwest Expressway (Brookshire Freeway). 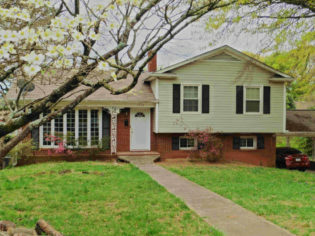 It became the longtime home of Mr. and Mrs. Kenneth S. Powell. Mr. Powell was Professor of Health and Education, Assistant Football Coach and Head Track Coach at JCSU. In 1969 the National Association of Intercollegiate Athletics honored him as Coach of the Year for track in the Carolinas. The CIAA (Central Intercollegiate Athletic Association) also named him a Coach of the Year, and in 1987 the organization inducted him into the CIAA Hall of Fame. 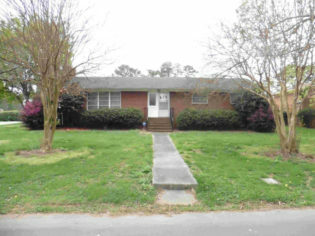 Built about 1952, first occupied by Frankie N. Ezell, owner and manager of the Evergreen Flower Shop at 734 E. 7th Street, and her husband Clifton A. Ezell, a porter for many years at Charlotte’s Union Bus Station. Built in 1957 for Presbyterian minister Rev. Hercules Wilson and wife Carrie D. Wilson. Rev. Wilson had helped organize Charlotte’s Brooklyn Presbyterian Church in 1911, then accepted a call to Westminster Presbyterian in Concord where he pastored forty years until retirement in 1957. He also served as Moderator (top regional administrator) of the Catawba Synod of the Presbyterian Church. When Rev. 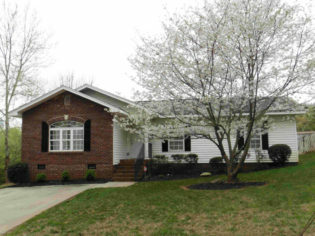 Wilson retired, he and his wife chose to move into McCrorey Heights. 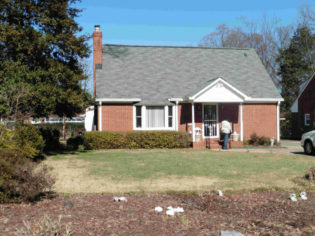 It was a place to be part of the cultural life of Charlotte, especially the intellectual and religious opportunities of Johnson C. Smith University, and many McCrorey Heights neighbors were Presbyterian ministers. Built about 1951 as the parsonage for First United Presbyterian Church, also known as Seventh Street Presbyterian. It was one of the city’s leading downtown congregations, responsible for the founding of Johnson C. Smith University. 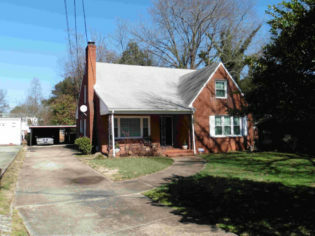 The first occupants at 1650 Patton Avenue, from about 1952 to 1962, were Rev. James W. Smith, Sr., pastor at Seventh Street Presbyterian, and his wife Margaret A. Smith, a longtime Charlotte school teacher. Built about 1949 – 50 for Joseph C. Belton, principal at Clear Creek (later renamed J.H. 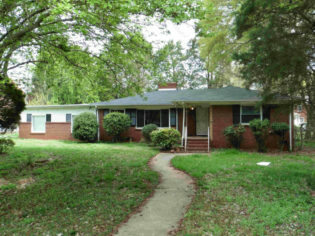 Gunn) School, the main African American high school for rural students in eastern Mecklenburg County. In 1965 he moved to Marie G. Davis Elementary where he retired in 1974. His wife Marjorie R. Belton led Charlotte’s Phyllis Wheatley Branch of the YWCA, one of the oldest African American YMCA branches in the South. Joseph Belton’s sister Mattie Belton DeLaine lived next door at 1706 Washington Avenue; she and husband Rev. J.A. DeLaine played roles of national importance in the Briggs v Elliott court case that led to the U.S. Supreme Court’s landmark Brown v Board desegregation ruling. Joseph Belton’s brother Moses lived a block away at 1809 Washington. He created JCSU’s office of public relations and took a leading part in desegregating Charlotte’s restaurants in the early 1960s. 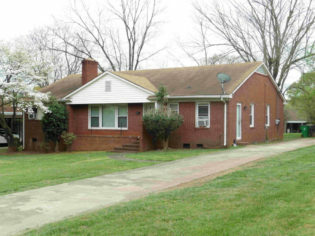 Built about 1960 and first occupied by Martha E. Reddick, Librarian at West Charlotte High School. Built in 1971 for Rev. J.A. DeLaine and wife Mattie Belton DeLaine, nationally important figures in the U.S. Civil Rights Movement. The DeLaines helped their neighbors in Clarendon County, South Carolina, file the first of the five cases that came together as Brown v Board of Education. The landmark 1954 ruling by the U.S. Supreme Court declared that racial segregation must end in education and by extension in all of American life — the most far-reaching Court decision of the twentieth century. Reprisals forced the DeLaines out of South Carolina. 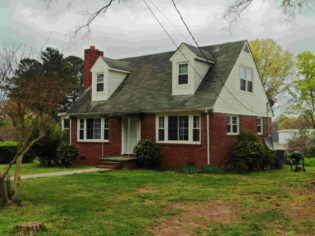 Their son, Joe DeLaine, Jr., arranged construction of this house near the residences of Mattie’s brothers Moses Belton (1809 Washington), who created JCSU’s office of public relations and took a leading part in desegregating Charlotte’s restaurants in the early 1960s, and Joseph Belton (1700 Washington), principal Charlotte’s Clear Creek (now J.H. Gunn) School and later at Marie G. Davis School. 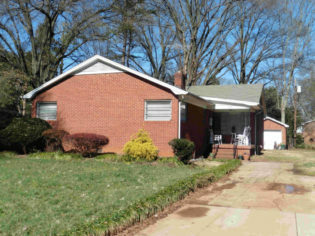 Miss Edna E. Morris took out the permit to build this dwelling on February 17, 1965. By the time that the city directory showed her here in 1967, she was retired. 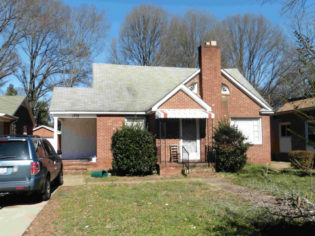 A Charlotte Observer story on June 5, 1918 listing the city’s school teachers noted that she taught at Fairview School, an African American elementary school in Fourth Ward — an indication that this house came at the end of a long career in education. 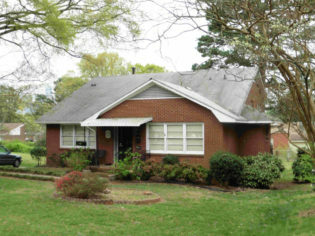 Built in 1952-53 and first occupied by Charles B. Maxwell and his wife Evelynne. The 1953 city directory listed him as a Mail Clerk at the Johnston textile mill in what is now NoDa, while she taught at Biddleville Elementary School, a short walk from her home. When Evelynne Hill Maxwell passed away in 1964, she was Principal at Amay James Elementary School off Charlotte’s West Boulevard. Her obituary in the Pittsburgh Courier, a national African American newspaper that often carried items from Charlotte, noted that she had served as president of the Charlotte City Teachers Association, the McCrorey Heights-based Moles social club, and Charlotte’s Lamba Omega chapter of AKA Sorority. Built 1966-1967 for Rev. Howard W. Givens, Jr., and wife Helen. He is best remembered for bringing together the churches that became Memorial Presbyterian Church and helping raise funds for its 1968 Beatties Ford Road building, a leading institution on Charlotte’s west side. Rev. Givens led the Ministerial Alliance of black churches, then won election as “the first man of color to serve as President of the [formerly all-white] Mecklenburg Ministerial Association,” according to his funeral program. His wife Helen Bampfield Givens taught school in Charlotte. She belonged to an illustrious Southern family, granddaughter of the African American Civil War hero and political leader Robert Smalls. Built 1958-59 for Rev. Elo Henderson, a leader in economic development issues during Charlotte’s Civil Rights era and a top official in the Presbyterian Church who made headlines across the South during the 1960s with calls for social and economic justice. He first made his mark as founding minister of Grier Heights Presbyterian Church, 1943 – 1955, where his accomplishments included re-using the historic Billingsville Rosenwald School as a community center. From 1955 through the mid-1970s he worked as the top executive in the Catawba Synod of the Presbyterian denomination, covering North Carolina and Virginia. He wrote “A Design to Liberate the Oppressed,” a strident manifesto for economic reparations. Locally he set up the Charlotte Frontiers Association which won the hiring of Charlotte’s first black bus drivers, opened employment at giant Southern Bell to African Americans above the rank of janitor, and trained hundreds of other workers. He and daughter Sula signed on as plaintiffs in the 1971 U.S. Supreme Court case Swann v. Mecklenburg, nationwide precedent for court-ordered busing to achieve school desegregation. 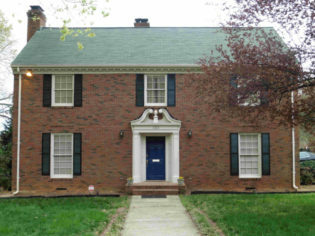 Built 1965 – 1966 as the President’s House for Johnson C. Smith University. It was first occupied by Dr. Rufus Perry, president of JCSU 1957 – 1968, who is remembered as the University’s “master builder.” An energetic fund-raiser and long-range planner, he led the construction of key new buildings including Brayboy Gymnasium, Duke Library, Memorial Student Union, and the Perry science center. Designer of the stately Colonial dwelling was A.G. Odell and Associates, Charlotte’s leading architecture firm in those years. 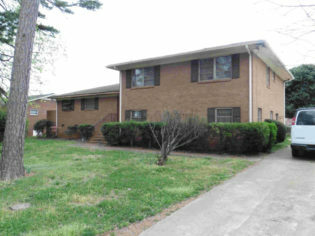 Subsequent JCSU presidents who resided here included Lionel Newsome (served 1968 – 72), Wilbert Greenfield (1973 – 82) and Robert Albright (1983 – 94). Constructed in 1955 for John William “Johnnie” Gray, Jr., a dining car waiter who worked for the Southern Railway for thirty-nine years, retiring in 1982. Railroad jobs were among the best open to African Americans in the era before the Civil Rights Movement. “He had a special way of reaching people with his magnetic personality, said his funeral program. His wife Ophelia “Kitty” Carson Gray taught for forty-seven years in Charlotte-area public schools, retiring in 1975. 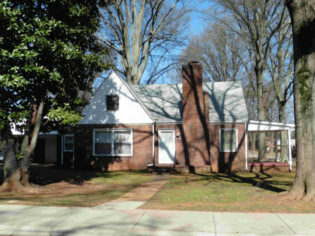 Built 1952-55 by one of Charlotte’s leading brick masons, Shade Payne, as the home for himself, wife Margaret Payne, and family. African Americans historically led the brick masonry trade, dating back to slavery times when most skilled artisans in the South were African American. Black brick workers were often among the most prosperous community leaders in many Southern cities through the mid twentieth century. Margaret Maxwell Payne taught at Plato Price School, then at Cochrane Junior High, retiring after thirty-five years. 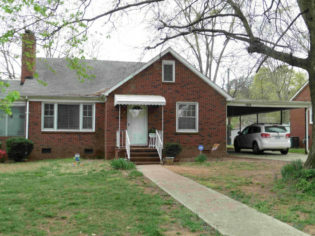 Built in 1955 – 1956, this was the longtime home of Rev. Moses Belton, the first Public Relations director at JCSU. He became an important behind-the-scenes bridge-builder during the Civil Rights era, serving on the Mayor’s Friendly Relations Committee which made Charlotte a national leader in desegregation. In particular, he helped arrange the integration of Charlotte’s upscale restaurants in May of 1963, a year before the 1964 U.S. Civil Rights Act. Mr. Belton’s wife Cornelia Greene Belton taught for nearly a quarter century in Charlotte’s public schools, retiring in 1974. Moses Belton’s brother and sister both lived nearby. Joseph Belton (1700 Washington Avenue) was a much-loved principal at J.H. Gunn and Marie G. Davis schools. Mattie Belton DeLaine (1706 Washington) with her husband Rev. J.A. DeLaine played a crucial role in the first of the five cases that came together in the U.S. Supreme Court’s landmark 1954 Brown v Board decision, outlawing racial segregation. 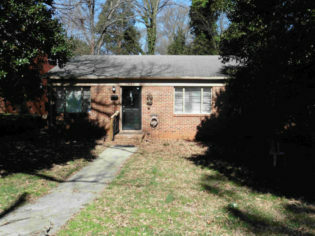 Built 1956 – 57 and occupied for many years by William Oliver, an educator in Charlotte’s public schools, and Blanche Rann Oliver, a music teacher. In 1968 William Oliver won appointment to Charlotte’s Park and Recreation Commission — the first successful appointment to any city board by Fred Alexander, Charlotte’s first black City Councilman in the 20th century.